1 media/25838_ca_object_representations_media_12943_mediumlarge.jpg 2017-01-13T12:07:56+00:00 Differences in Worldview 16 image_header 2017-01-21T09:49:44+00:00 When Swedes and English interacted face-to-face with the Lenni Lenape or Shawnee, they encountered one another in the fundamental differences, not only of language and culture, but of underlying worldview as well. The differences in worldview between Indians and Europeans informed early negotiations between the groups, which involved moving back and forth between differential understandings of property, language and writing, social customs, and notions of reciprocity. This activity introduces the concept of cultural worldview and allows students to understand how Native and European ideas of time, the spirit world, property and social relations differed from one another. Students are encouraged to speculate on how these differences informed both accommodation and misunderstanding between the two groups. How has social disagreement and collaboration benefited Pennsylvania society? Recognize the idea of worldview as a way of understanding/viewing cultural difference. Understand key differences between Native American and European worldview vis a vis time, property, land, communication, and social/political relations, and identify how these differences shaped interactions such as diplomatic negotiations. Distinguish different points of view for historical events. Recognize point of view in historical narratives and how it shapes the telling of history. The Indians Giving a Talk to Colonel Bouquet...​, an engraving by Benjamin West. According to "An historical account of the expedition against the Ohio Indians," the Muskingum camp was selected as the site for the negotiation of prisoners because many Native American settlements were situated in close proximity to this location. It was the intention of the Europeans to display their military strength and to easily engage these numerous settlements in battle if the negotiations were not successful. Review each word and ask students to share their responses, listing them on the board. Afterward, go back and look at what is written down. Assign a plus, minus, or 0 beside each word according to the kind of feeling (positive, negative, or neutral) evoked by the term. When the exercise is completed have the class discuss: What kinds of feelings are evoked by specific terms? What patterns do they see in responses that were neutral, positive, or negative? Are any of the responses stereotypical? How and why? 2. Infer worldview: Have students examine the engraving The Indians Giving a Talk to Colonel Bouquet... by Benjamin West, from An historical account of the expedition against the Ohio Indians, in the year 1764. Note the location of the engraving: The caption of the engraving reads, "The Indians giving a talk to Colonel Bouquet in a conference at a council fire near his camp on the banks of the Muskingum in North America in Oct. 1764." It is important to note that according to An historical account of the expedition against the Ohio Indians, the Muskingum camp was selected as the site for the negotiation of prisoners because many Native American settlements were situated in close proximity to this location. It was the intention of the Europeans to display their military strength and to easily engage these settlements in battle if the negotiations were not successful. Native Americans are seated on the ground; Europeans are seated on chairs. Native Americans are all leaning forward listening intently to what is being said and have intense expressions on their faces; Europeans are writing everything down. Native American figure in the center is gesturing dramatically and holding something in his hand (wampum); Europeans are partially turning away and one man pulls his body away with his hand across his chest. Native Americans are positioned in the engraving so that their background is of the landscape; Europeans are framed by a man-made wooden structure. Native Americans have a comfort with nature and more open body posture. Native Americans use oral communication; Europeans rely on formal writing. 3. Introduce and discuss the concept of cultural worldview. Ask the class "Who created the engraving?" Tell students that the engraving is an example of the worldview the Europeans held during the colonial era. Describe worldview as a kind of "cultural sunglasses" through which we see and experience the world. Discuss how worldview is a deep kind of cultural understanding that shapes our reality but usually lies beneath the level of everyday awareness. Thus, worldview seems "natural" even though it is cultural. Compare and contrast Native and European worldviews in terms of time, relationship to nature, ownership of property, and social interaction. Using the Worldview worksheet, create a diagram with students that map out these differences. Have students discuss, in pairs or small groups, how the patterns represented in the engraving embody these differences. What do you think would be the worldview from a Native American perspective? What do you think a European’s worldview be? Given differences in worldview, what challenges did Native Americans and Europeans face when interacting with one another? How might these differences of worldview have led to misunderstandings or conflict even when both parties had good intentions? Have students pick one these topics and write a short essay answering the posed question. Collect the essays at the end of the class period. This could also be used as a take home activity. 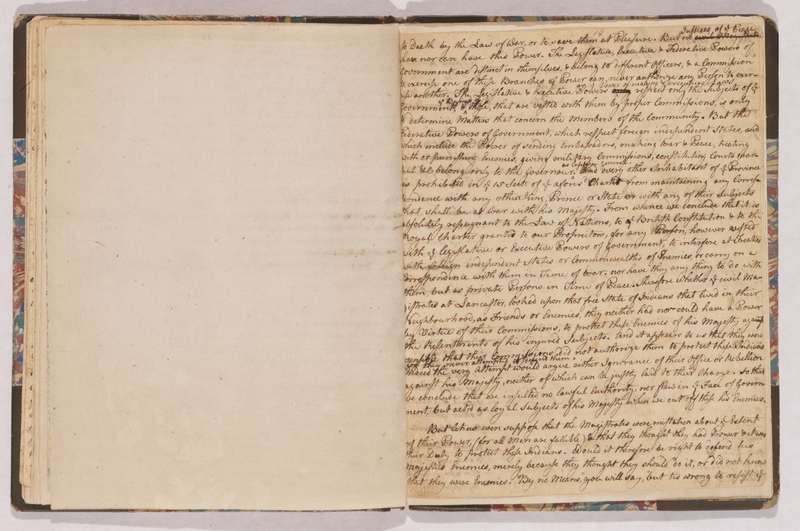 How would you describe the Quakers relationship with the Native Americans? With the volunteers? Should the Volunteers be punished for murdering Native Americans? Do you think this deposition swayed the pubic to the side of the volunteers? Native American: indigenous or original inhabitants of the Americas prior to European arrival. Negotiator: an individual who has the authority to represent or speak for a nation or other entity during a diplomatic conference or any other process whereby diverse parties resolve disputes, agree upon courses of action, or bargain for advantage. Paxton Boys: frontier settlers who attacked Indians living at Conestoga, Lancaster County, in 1763. Treaty: binding agreement under international law. Worldview: an integrated system of deeply held, largely unconscious beliefs and concepts about the universe (natural and/or supernatural), society, and the self. 1 media/brubaker cover iamge.jpg 2016-10-24T08:09:43+00:00 The Aftermath of the Conestoga Massacre 7 Jack Brubaker image_header 2017-03-14T12:51:35+00:00 How did the Paxton Boys avoid punishment for killing 20 peaceful Conestoga Indians under government protection? More than 250 years after the massacre, there is no clear answer to that question. But it is clear that a legal system that had previously punished white men for killing Christian Indians failed catastrophically in the County of Lancaster and the Commonwealth of Pennsylvania in December 1763. Many British and provincial leaders understood that identifying, trying, and punishing the killers of the Conestogas was critical to maintaining the rule of law. 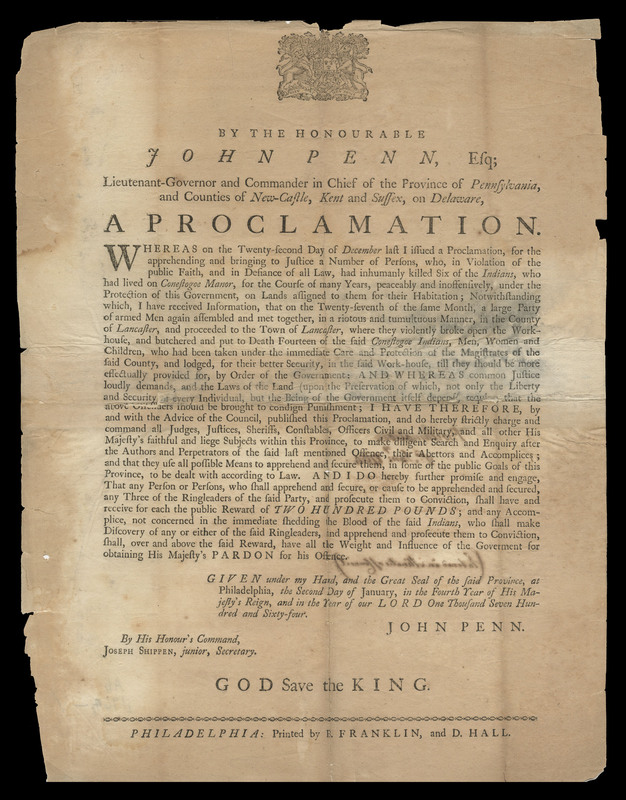 The British statesman Lord Halifax condemned the “horrid murders” and ordered Thomas Gage, chief of British armies in North America, to assist Pennsylvania’s government in finding and punishing the killers. Pennsylvania Governor John Penn delivered two proclamations condemning the Paxton Boys’ “barbarous” behavior and issued arrest warrants and rewards for information leading to convictions. He further requested that Lancaster County’s magistrates interrogate the county sheriff, coroner, and any others who might have information about the murderers. These should not have been difficult tasks. Lancaster’s magistrates and other residents knew the identity of some of the killers. On the day before the first attack, leaders of the vigilantes told John Elder, pastor of Paxton Presbyterian Church and military leader of the Paxton militia, as well as Edward Shippen, Lancaster County’s chief magistrate, that they planned to attack the Indians at Conestoga Indian Town. Neither man did anything to stop the slaughter or identify the killers. After leaving Indian Town in flames following the massacre of the first six Conestogas, the killers talked at some length with Thomas Wright, an Indian Town neighbor, and Robert Barber, a resident of nearby Wright’s Ferry. Given the tone of the conversation, Wright and Barber suspected the worst and soon discovered they were correct. They could have identified some of the killers. Scores, perhaps hundreds, of Lancaster residents observed the raiders as they marched to and from the slaughter of the last fourteen Conestogas at the Lancaster County workhouse in the center of Lancaster. But no one identified them. One reason for this silence was indifference. Many Lancastrians did not pay much attention to the killings, either because they accepted the Paxton Boys’ allegation that the Conestogas had been spying for hostile Indians or because they did not care about the fate of any Indians, peaceful or hostile. Another reason was intimidation: the Paxton Boys threatened those who might have informed on them. James Wright, one of Lancaster County’s delegates to the Pennsylvania Assembly, a government-appointed caretaker for the Conestogas and a Quaker, might have been expected to identify the raiders he knew. A Pennsylvania historian reported in 1857 that Wright “well remembered” the killers and had told a fellow legislator that he had “survived nearly the whole of them, and that they generally came to untimely or suffering deaths!” (Watson 169). But Wright never identified any of the Paxton Boys. 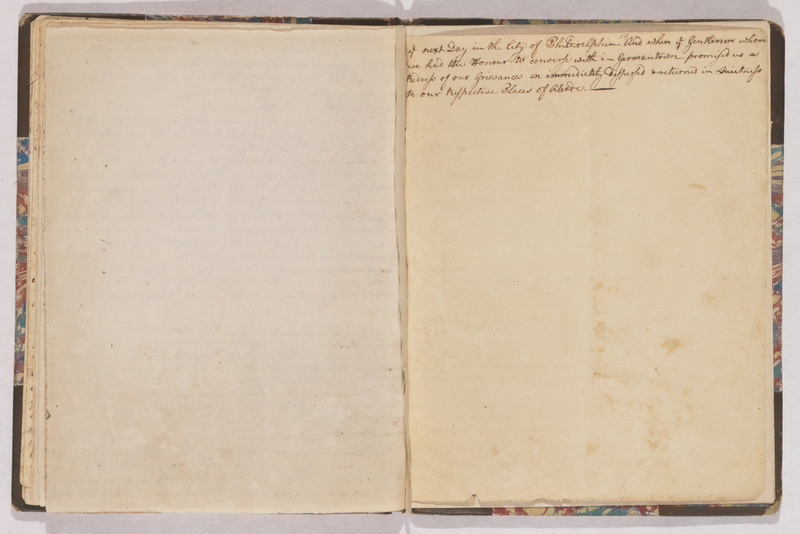 His sister, Susanna Wright, explained that Paxton vigilantes roamed about the area after the massacre, making threats against her brother and other Quakers. Meanwhile, Lancaster County’s magistrates bizarrely modified their instructions from Governor Penn. Instead of collecting depositions naming the murderers, they obtained affidavits from residents who despised Indians. 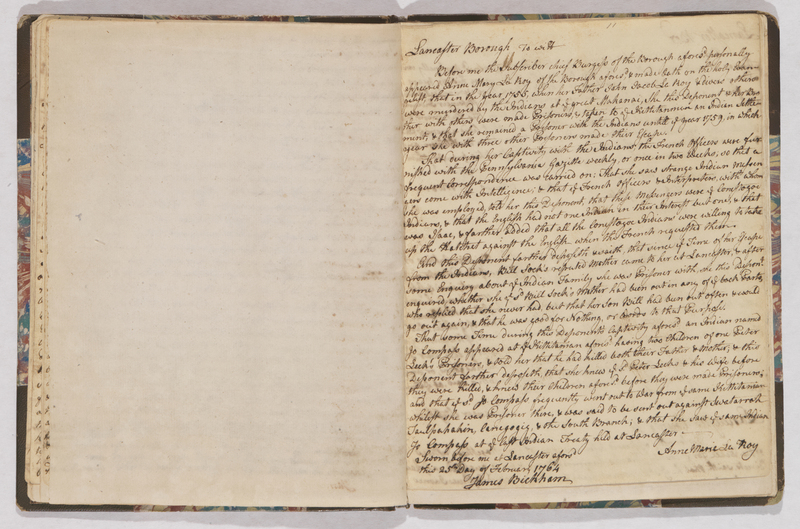 These affidavits are not included in court records—in fact, nothing related to the Conestoga massacre appears—but they do appear among pro-Paxton manuscripts produced early in 1764. None of these affidavits mention the Paxton Boys. Most cast blame on the Conestogas. 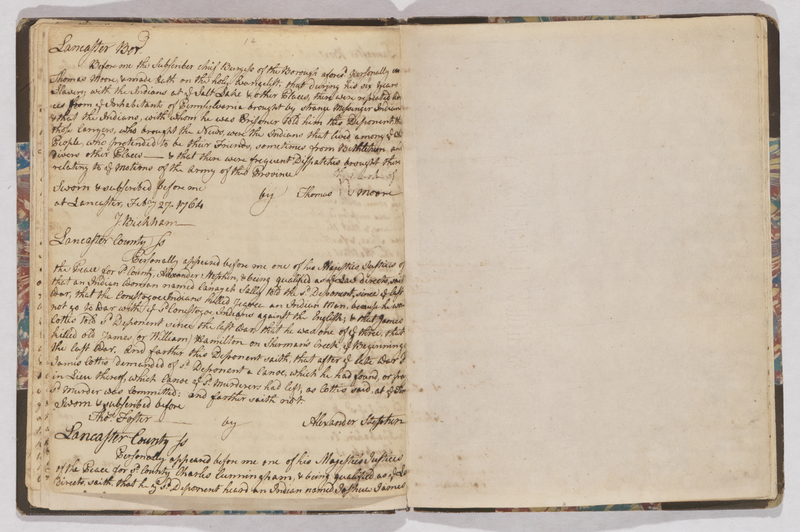 Nothing in these affidavits relates in any way to Penn’s request that the magistrates obtain information about the men who had killed the Conestogas. Nothing in these accusations, which rely heavily on hearsay, clearly indicts the Conestogas for crimes against settlers. In sum, the affidavits seem to blame the murder of the Conestogas on the Conestogas themselves. While the magistates’ response was not unpopular among the general citizenry, it incensed some groups, particularly Pennsylvania Quakers. Quakers were quick to condemn the killers and those who paved the way for the killings. These “abettors,” according to several sources, may have included the county’s jailer, who unaccountably disappeared from the jail and workhouse on the day of the second massacre; and the county sheriff and coroner—the only “guards” at the workhouse—who quickly stepped aside when the Paxton Boys arrived to do their bloody work. John Reynolds, editor of the Lancaster Journal, later indicted several Lancastrians for their part in what he termed a conspiracy against the Conestogas. He said that the jailer, the sheriff and his son, and two other men “were also suspected of being in the plot” (Mombert 187). Others pointed to more obvious targets, especially the Rev. Elder and Judge Shippen. Elder, as the man who ministered to many of the Scots-Irish Paxton Boys in his church and led the Paxton militia in the county’s defense against hostile Indian attack, wielded great influence. As a large landholder in the Paxton area, some observers believe, he may have had a personal reason to rid the area of any Indians who would discourage investment on the frontier. As chief magistrate, Shippen held more power than any other Lancastrian. Few actions of substance occurred in Lancaster County without his approval. 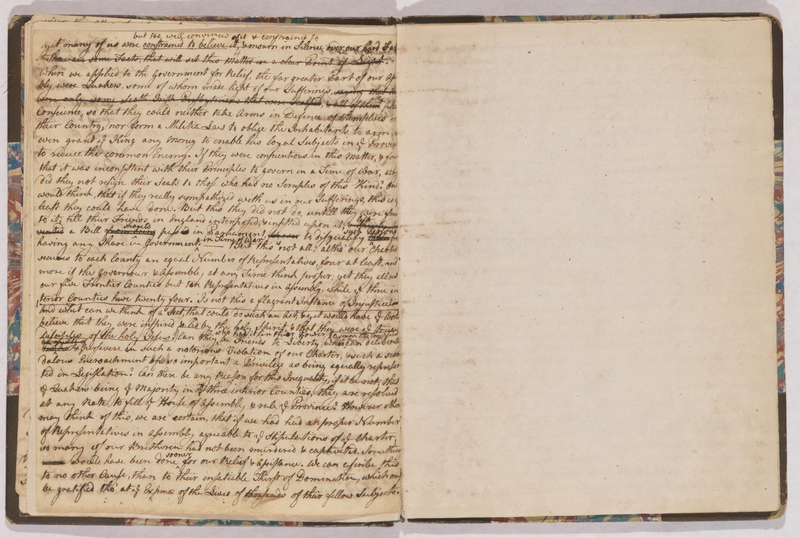 Early Quaker historian Robert Proud directly blamed the murder of the Conestogas on “the connivance, if not the encouragement, of the Christian-professing Magistrates, and other principal persons of that town” (Pound 329). While critics questioned why the magistrates did not employ a British regiment to guard the Indians against a second attack that they knew was coming, Shippen’s explanation to John Penn was that he did not know some 200 soldiers were billeted in a town of 2,000 residents. Concerns about the massacre faded with time. As it became clear that the authorities had no interest in discovering who had killed the Indians, let alone who may have helped them, most people moved on to other matters. But John Penn’s critics kept up a drumbeat for years. They charged that officials in Philadelphia and Lancaster had a political reason to avoid punishing the Paxtonians. In the 1760s, the militant Germans and Scots-Irish gained greater political power, at the expense of Quakers and German pacifists. Those who wanted to retain power found it useful to defend the Paxton Boys’ slaughter and to oppose the Quaker lobby that defended Indians. In the autumn elections of 1764, a united “new ticket” of Presbyterians, Anglicans, and Lutheran and Reformed Germans supported stronger anti-Indian policies. They won more seats in the legislature—although not enough to take control—and then strengthened their influence as the decade progressed. Some observers suggested that John Penn may have had another motivation for siding with anti-Indian forces. They believed he had made a deal with the Paxton Boys when they marched on Philadelphia following the killings in Lancaster. They claimed he had made political promises in exchange for retreat from a planned assault on the city to kill Lenapes, the so-called Moravian Indians, being held for their protection there. When we consider the Manner of committing the Murders at Lancaster; that it was done at Noon-Day, in the midst of a Populous Borough, and in the Presence of many spectators by Men probably of the same County, undisguised and well known, we apprehend their Names may be easily discovered (Colonial Records 441). But this was a legislative exercise in futility. More than four years after the massacre, most Pennsylvanians understood that the names of the killers would remain unknown. Recognizing that the Paxton Boys might not be brought to justice, some officials worried about how the killings might affect the conduct of other Indians, especially the Iroquois. 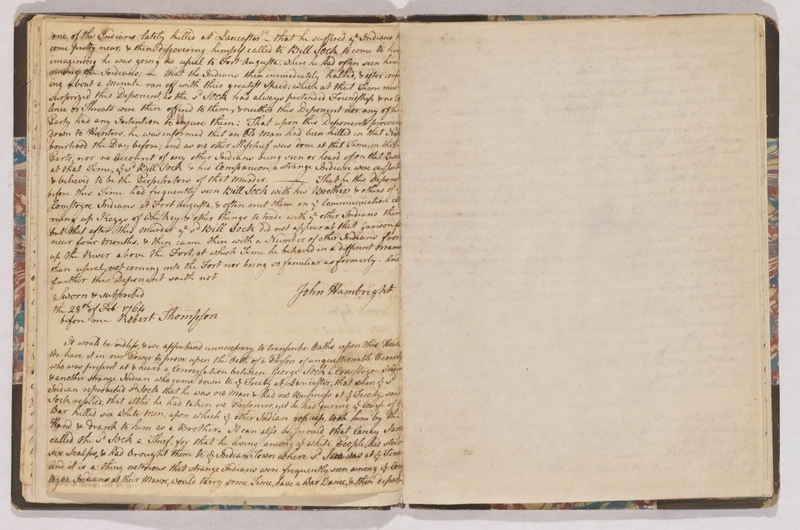 In the winter of 1764, Sir William Johnson, British superintendent of Indian Affairs in the Northern Department, told Penn he was concerned that the incident would “stagger the affections” of the Iroquois (Colonial Records 130). In fact, repercussions from the massacre continued for years. At treaty sessions, the Iroquois repeatedly cited the fate of the Conestogas as a reason not to trust white negotiators. Other Indians living in Pennsylvania’s white settlements never trusted the government to sanction the Paxton Boys or to protect other Indians. Many Lenape immediately fled the state. Hannah Freeman and other Indians living in Chester County moved to a Quaker community in New Jersey. An Indian named William Peters told Samuel Hunter at Fort Hunter, north of Harrisburg, that he feared for his safety after the massacre and the march on Philadelphia. The Moravian missionary John Heckewelder reported that the Lenapes believed Indian-settler relations had been poisoned because the Conestogas’ “blood ran in streams into our (treaty council) fire, and extinguished it so entirely, that not one spark was left us whereby to kindle a new fire” (Heckewelder 80). A group of Lenapes that had moved to Ohio declined aid from the Continental Congress early in the Revolutionary War because they feared the government might “protect” them as it had the Conestogas. 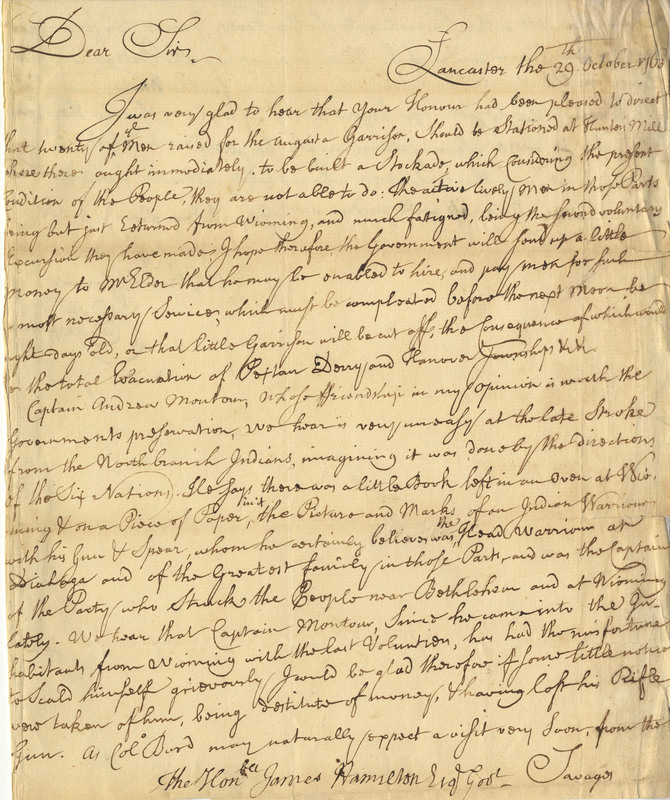 These Indians clearly recognized the significance of the decision by British authorities, Pennsylvania’s governor, and Lancaster County’s magistrates not to pursue the murderers of the Conestogas. The time for killing any and all Indians, it was clear, had been extended to all seasons. The wounds of the 1763 massacre never have healed, although multiple efforts have been made at reconciliation. In recent years, various groups have apologized for the actions of the Paxton Boys and the ineffectual leaders of the Lancaster community. They have lamented the utter failure of the judicial system. In 2003, a group of Lancaster County Mennonites and evangelicals met with representatives of the Iroquois from New York. The Mennonites guided the Iroquois on a tour of sites associated with the Conestogas. They asked for forgiveness for their ancestors’ sins of killing Indians and stealing their land. The Iroquois forgave the Mennonites and the two groups embraced. In 2010, a meeting of reconciliation was held at First Presbyterian Church in Lancaster. Representatives of Mennonite, Quaker, Presbyterian, and other churches acknowledged to several Indian groups that early Pennsylvanians were wrong to break treaties and kill the Conestogas. For the first time, Presbyterians acknowledged the role of their predecessors in the massacre. And, for the first time, a Lancaster official acknowledged fault. Mayor Rick Gray expressed his distress that previous town leaders did not protect those they had pledged to protect. Most recently, in the spring of 2016, a bishop from Lancaster County’s Amish settlement met with representatives of a dozen Indian tribes. The bishop and two other Amish men apologized for the way their ancestors treated Native Americans and took their land. In an emotional session, both groups shed tears. The reconciliation process continues. 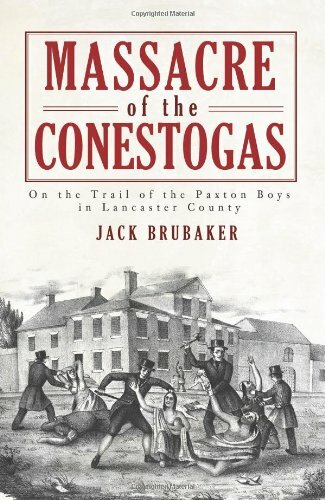 This essay is based on a book by Jack Brubaker, Massacre of the Conestogas: On the Trail of the Paxton Boys in Lancaster County. To learn more about Brubaker, visit the Creators page. Elder Collection, Dauphin County Historical Society, Harrisburg, Pennsylvania. Heckewelder, John. History, Manners, and Culture of the Indian Nations, Philadelphia: 1876. Loskiel, George H. History of the Mission of the United Brethren among the Indians in North America. Trans. Christian Ignatius La Trobe. London: Printed for the Brethren’s Society for the Furtherance of the Gospel: 1794. 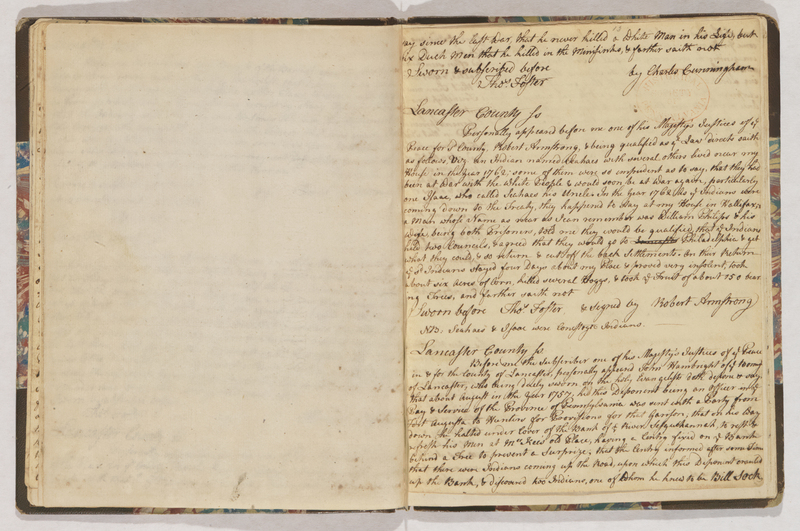 Minutes of the Provincial Council of Pennsylvania (Colonial Records). 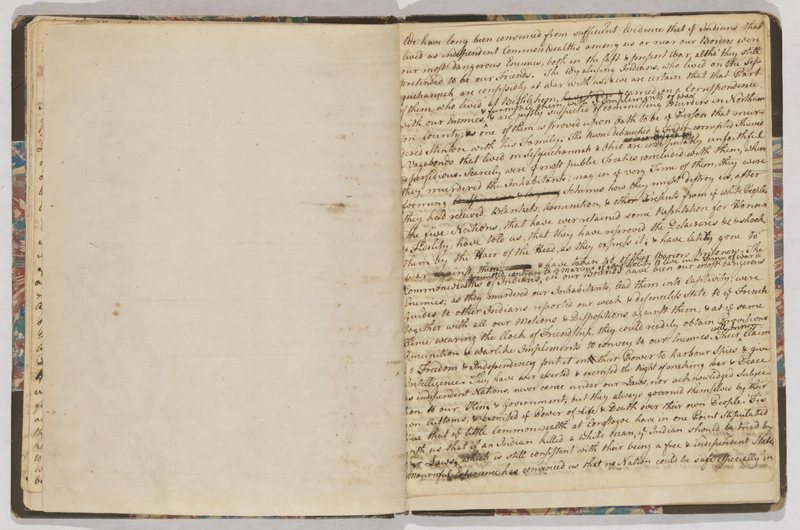 Pennsylvania Archives. Mombert, Jacob. An Authentic History of Lancaster County in the State of Pennsylvania, Lancaster, 1867. Proud, Robert. The History of Pennsylvania in North America. Vol. 2. 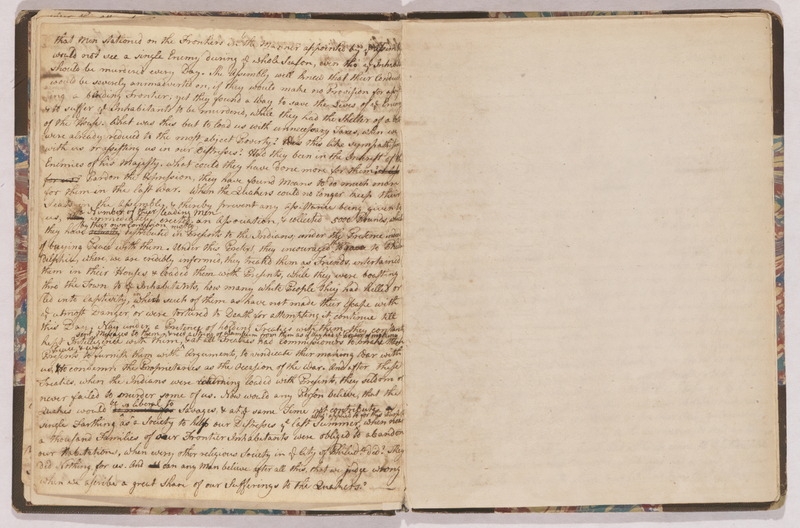 Philadelphia: Zachariah Poulson Jr., 1798. 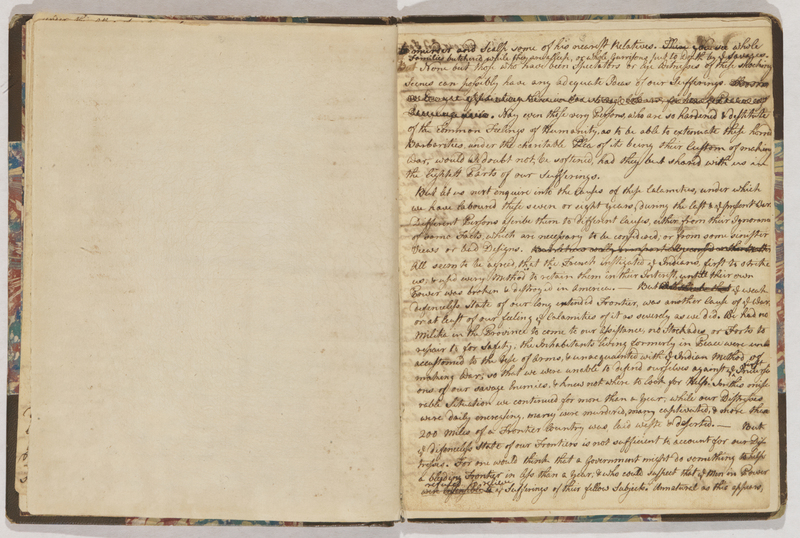 Shippen Papers. 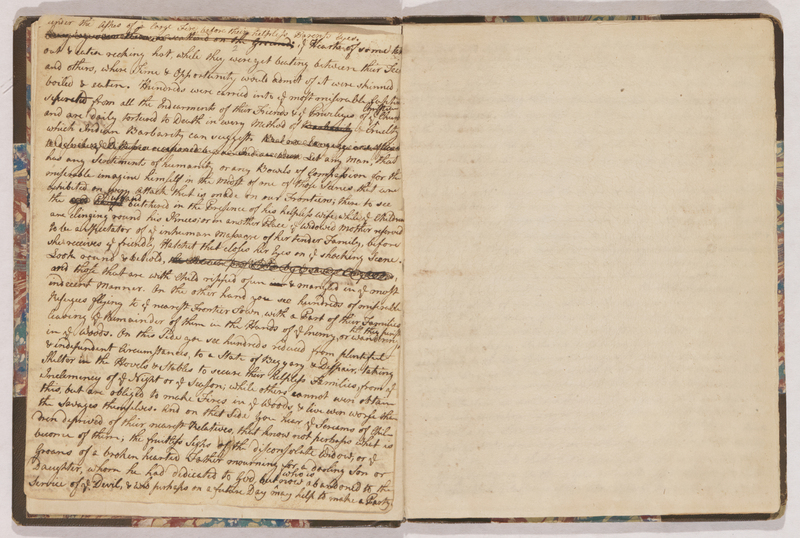 American Philosophical Society and Historical Society of Pennsylvania, Philadelphia. Watson, John. 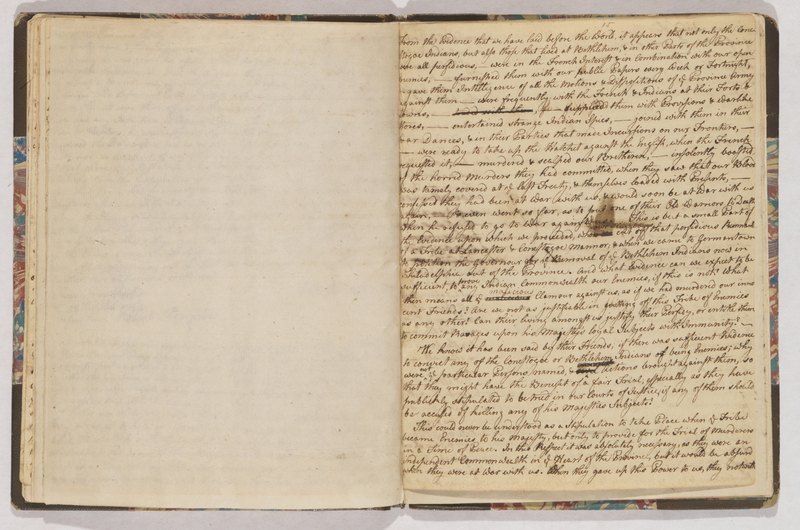 Annals of Philadelphia and Pennsylvania. Vol. 2, Philadelphia: 1884. Post learning objectives before students arrive. Prepare slides with the text specified below. Configure projector to display the entry ticket on the board. Distribute entry tickets as students enter the classroom ("egregious sesquipedalian loquaciousness"). Cold-call students, asking them what they think the entry ticket means. If no one understands the ticket, the teacher clarifies that "egregious sesquipedalian loquaciousness" means "saying something in the most complicated way possible." Ask students if they can think of examples of overly complicated language. 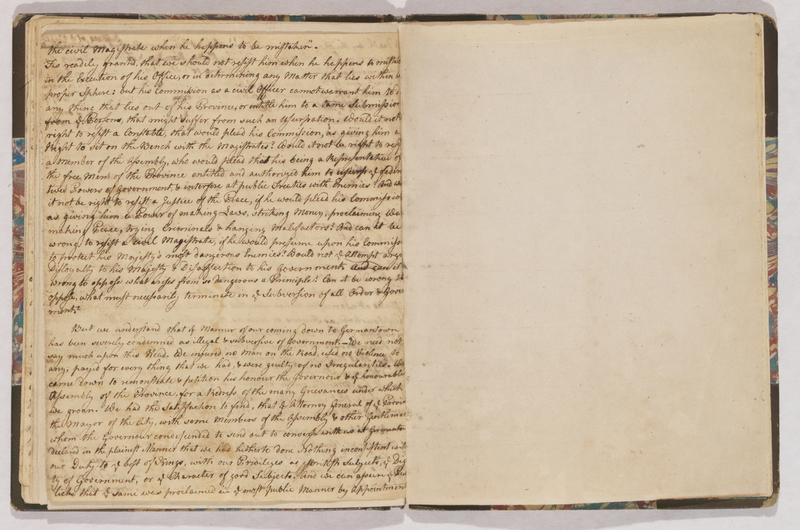 Suggest that sometimes historical documents such as the Declaration of Independence and Constitution sound complicated. Explain that writers in the eighteenth century spoke differently than we do today, often using more complicated syntax. For that reason, we need to practice to understand them. Announce that the class will practice with several passages together before moving on to an eighteenth-century document. Project example one: "An Enumeration of Consequences of Erudite Vernacular Utilized Irrespective of Necessity." Irrespective of Necessity → "needlessly"
The draft of the new sentence should read: "List of problems of intellectual words used needlessly." Demonstrate that the sentence may need revision. A translation may be: "A list of problems with needlessly complicated words." Project example two. Identify example as approximately 70 years old: "The individual member of the social community often receives his or her information via channels utilizing distinct visual symbols." Guide students through this example. Call on students to translate individual words and phrases. If no students know the definition for a word, allow students to look it up on a device. Once students translated the entire sentence, simplify it, e.g. "People read." 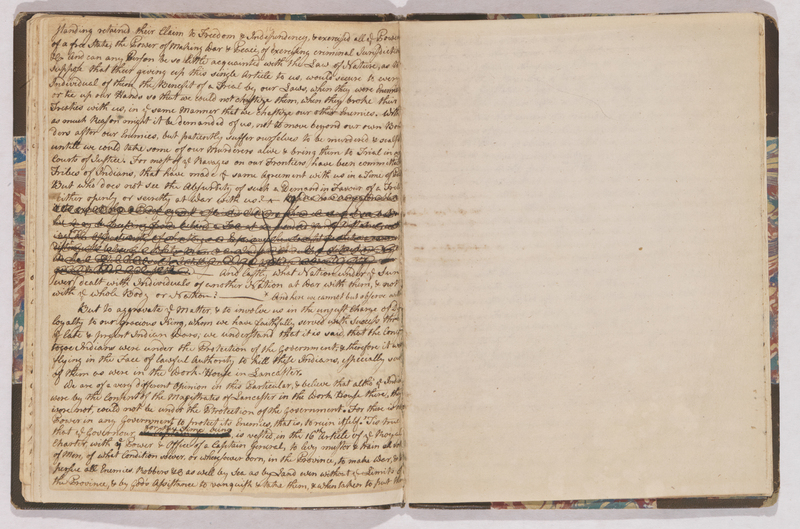 Project example three (Jeremy Bentham). 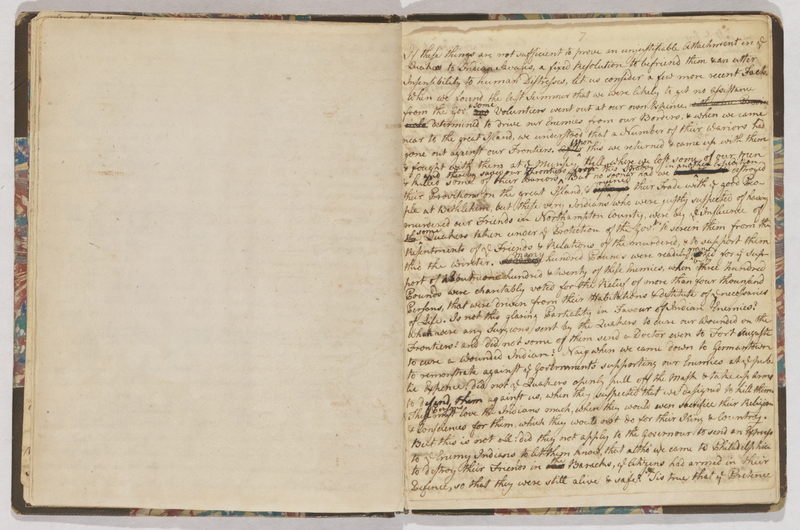 Identify example as written in the 1700s: "A man may be said to be partisan to the principle of utility, when the approbation or disapprobation he annexes to any action, or to any measure, is determined by and proportioned to the tendency which he conceives it to have to augment or diminish the happiness of the community"
Explain how readers can divide the text by clause. In this case, divide before "is determined." A translation may read: "a person who likes useful things judges things as good or bad based on whether they make people more or less happy." Distribute assignment sheet and explain assignment. 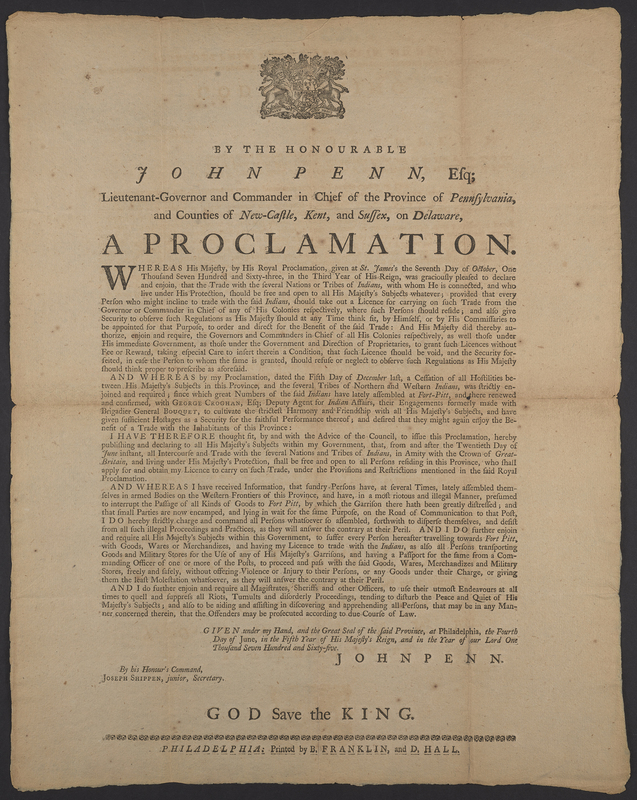 Students will transcribe one paragraph of the Penn Proclamation June 4, 1765 word-for-word, translate it into modern English, and write a short reflection afterwards. Count students off by threes. Ones work on the first paragraph, twos work on the middle two paragraphs, and threes work on the final two paragraphs. Students are to work individually. Distribute laptops to students and circulate during work period. Students submit transcripts via Google Drive. Ask students to share their transcriptions of the assignment. Ask students to share their thoughts on the assignment. How was the grammar unfamiliar? What words were spelled differently? Assign a one-paragraph reflection as homework. Students should consult their classmates' work on Google Drive as they write their reflections. Provide feedback on student rubrics. Download a printable version of this procedure. Download a printable version of the entry ticket. 1 2017-03-29T06:10:49+00:00 Paxton Defense 1 plain 2017-03-29T06:10:49+00:00 Between February and March 1764, Paxton leaders and sympathizers crafted a defense of the massacre that appealed to prejudices against Philadelphia Quakers and fears of further frontier violence. 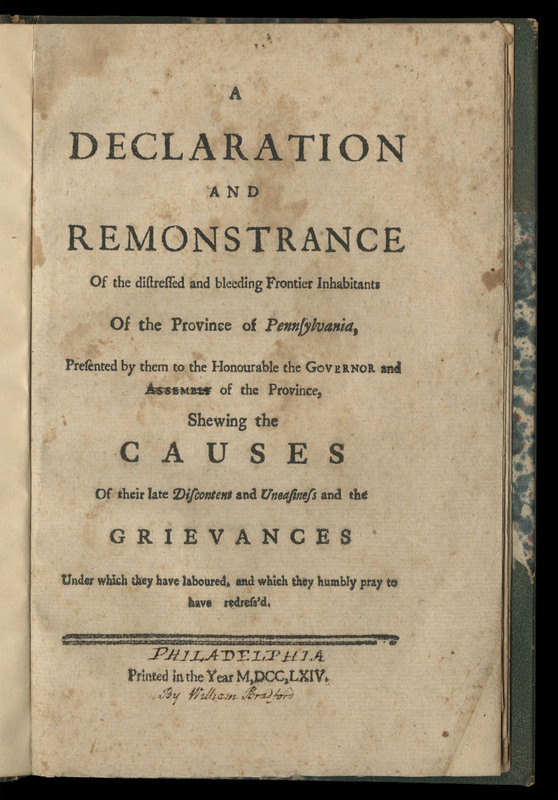 Matthew Smith, Declaration and Remonstrance (Philadelphia, 1764). In exchange for disbanding at Germantown, Paxton leaders secured the right to broadcast their grievances in Declaration and Remonstrance. Their representative, Matthew Smith, read the essay as early as February 15, just a week after the marchers arrived in Germantown. 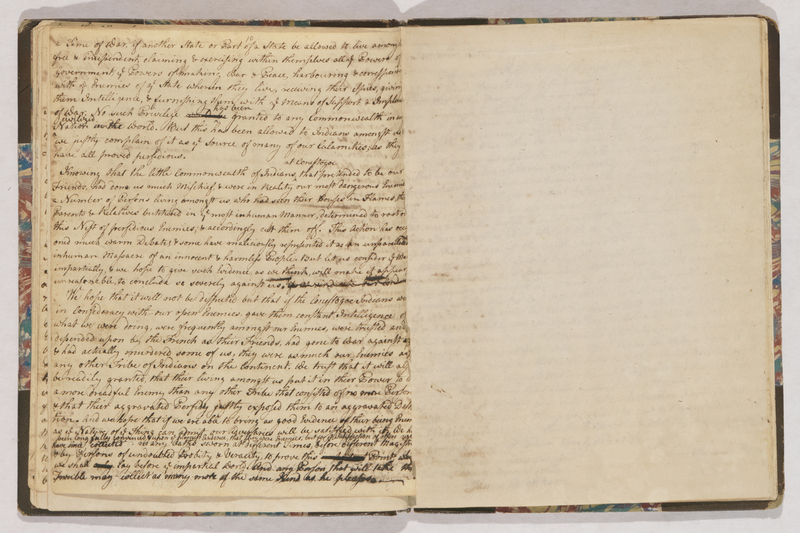 Though written in haste, Smith’s grievances galvanized sympathizers who distrusted the friendly relations of Quaker and Susquehannock, and suspected that leaders intentionally withheld support from backcountry settlers. 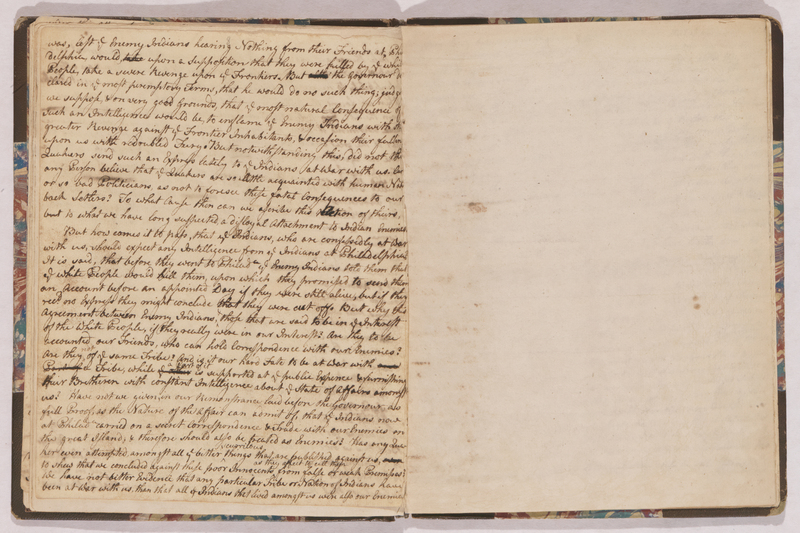 The syntactical repetition of “falsely pretended Friends” (the Susquehannock) and “falsely pretended Indian Friends” (Quakers) served to conflate Friendly Indian with Indian Friend. 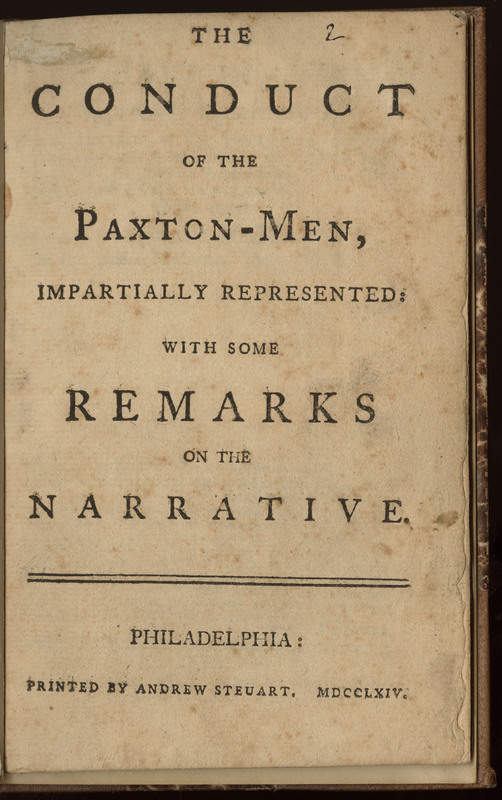 Anonymous, Apology of the Paxton Volunteers (Philadelphia, 1764). 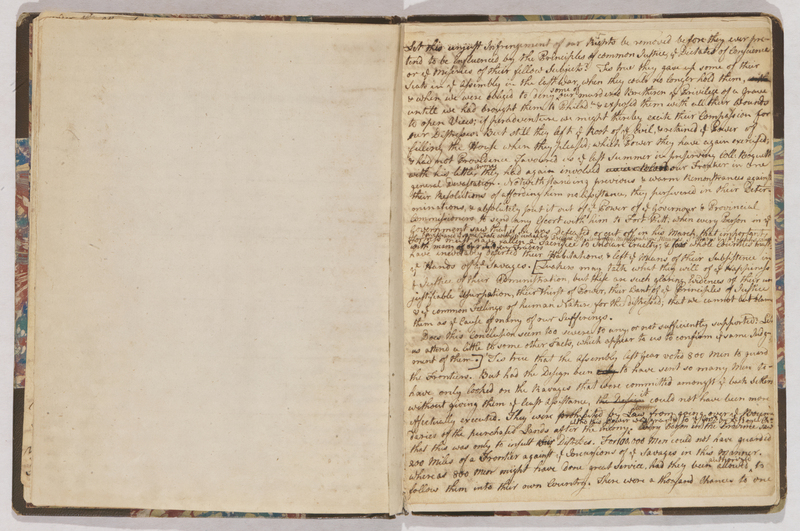 This unpublished, anonymous manuscript added visceral depictions of frontier warfare to Smith’s account. In place of native carnage (as in Franklin’s Narrative), the volunteers describe the mangled bodies of backcountry settlers. 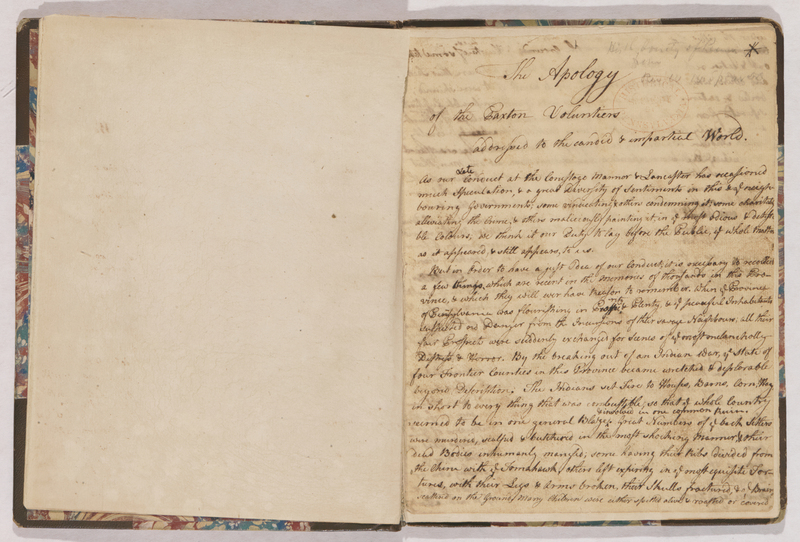 Whereas Declaration advocated for changes in settlement policies, Apology sought the vindication of the Paxtons. Thomas Barton, The Conduct of the Paxton Men (Philadelphia, 1764). Conduct marks a turning point in the pamphlet war. While the pro-Paxton pamphlet was originally published anonymously, it has since been attributed to Thomas Barton, an Anglican missionary from Lancaster. Barton synthesizes the apologist strategies of Declaration and Apology and provides a forceful response to Franklin’s Narrative. The pamphlet disparaged the reputation of the native victims, justified the conduct of the Paxton Boys using gratuitous scenes of frontier violence, and assailed the motives and pacifist principles of Quaker Assembly members.